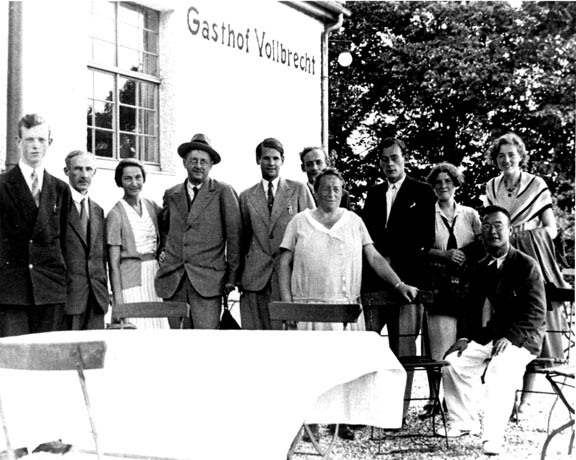 This photograph shows a few of Emmy Noether's colleagues and acquaintences, all but one identified in Brewer and Smith's book, Emmy Noether: A Tribute to Her Life and Work. Emmy Noether's early development as a mathematician was shaped in part by her father, Max Noether, and his colleague, Paul Gordan. Both were professors of mathematics at the University of Erlangen. Ernst Fischer at Erlangen influenced her away from Gordan's constructivisit style, dominated by forms and formulas, toward Hilbert's more axiomatic and abstract style, characterized by existence proofs. In 1915, Noether accepted an invitation from Hilbert and Klein to move to Göttingen, the "Mecca of Mathematics." There she became a world-class algebraist who attracted students and younger colleagues who themselves became leading mathematicians. Paul Gordan (1837-1912) Emmy Noether's dissertation advisor, "king of invariant theory"